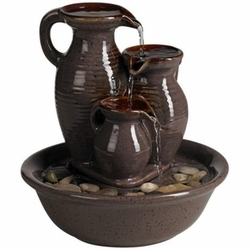 A Triple Jug tabletop fountain is a great way to add a peaceful calm to your decor. 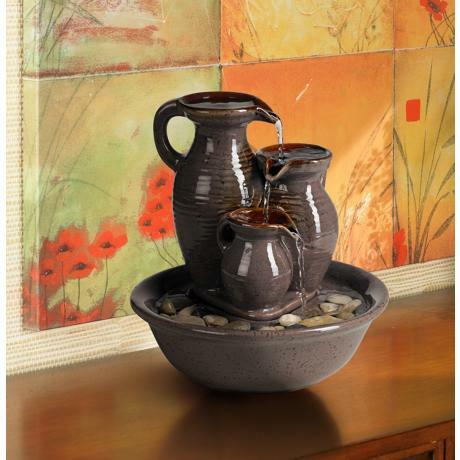 This indoor/outdoor tabletop fountain features three charming, chocolate speckle finish jugs in a round bowl on a bed of polished river rocks. Water flows from the tallest jug into the vessel at the bottom, powered by a recirculating pump. Makes a great tabletop accent, indoors or outdoors.